You don’t need warm weather to enjoy a raw veggie salad, in fact, we appreciate a fresh salad as the main dish just about any day of the year. Of course, on holidays we might go all out with a copious serving of salt and pepper pork belly, but we try to bring in more green, even at breakfast, because we know that’s where a bounty of minerals and nutrients can be found. Diversity is the key to a healthy diet! Salmon is an excellent source of fat, and it is more than okay to go wild – if you can find it. You might also discover organic farmed salmon at your supermarket – above all, go for quality, not quantity. It may take some time to source the best available fish in your area, but it is definitely worth the effort to read the labels. How much salt is added? Any other preservatives? With time, reading labels becomes easier. Smoke salmon is also an option to try out for this salad, but remember that smoked salmon has a shelf life of just a few days once it is opened, so choose the right size package for you and your lunch companions if you go this route. If you have leftover salmon, you can do a variation on the theme and enjoy a similar, yet different, smoked salmon with fresh vegetables the following day. In a bowl combine the olive oil, vinegar, lemon juice, parsley, and season to taste. 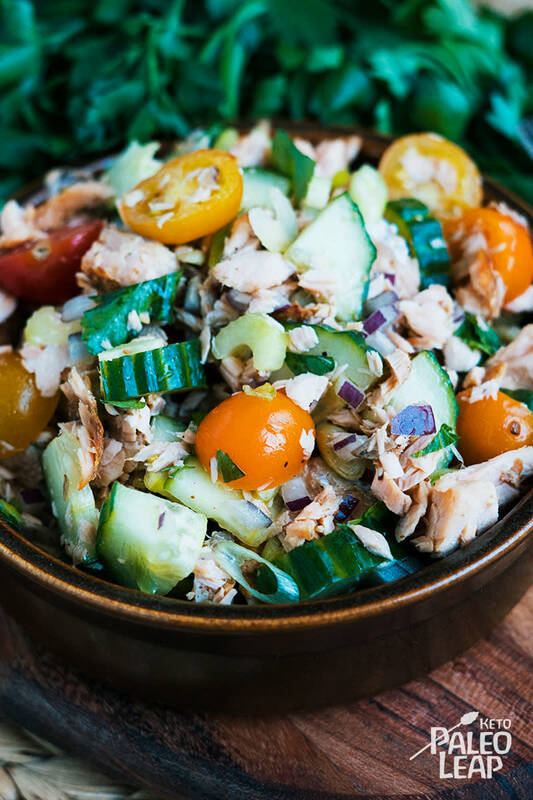 In a salad bowl combine the cucumber, grape tomatoes, red and green onions, celery, and flaked salmon. Pour the dressing over the salad and gently toss everything. Serve topped with additional fresh parsley.